Apple on Monday announced its quarterly earnings call for the third fiscal quarter of 2014 is slated for July 22 and will be the first such event for Luca Maestri since being officially confirmed as the company's new CFO. Alongside Maestri, Apple CEO Tim Cook is expected to take part in the conference call discussing the company's performance over the three-month period ending in June. 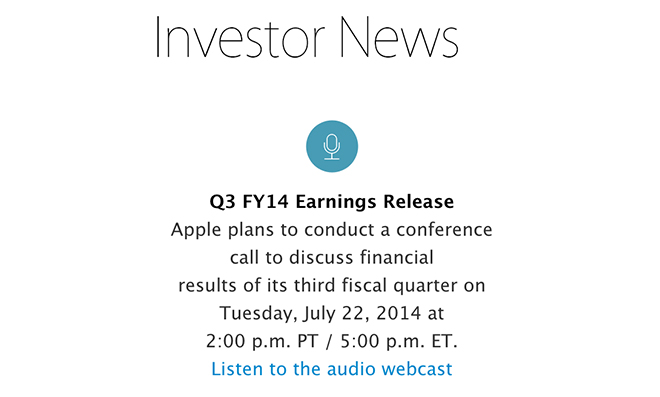 The date was first announced on Apple's Investor Relations webpage. For its second fiscal quarter of 2014, Apple announced record earnings of $45.6 billion in revenue, a performance that came in as the highest-ever non-holiday quarter on record. Apple is also likely to discuss the effects of a recent 7-for-1 stock split carried out this month, making AAPL shares more accessible to traders. Since trading began at the adjusted $92.69 share pricing, AAPL stock has been fairly stable, ending trading on Monday at $92.93. During the last quarterly call, Apple said it would be investing heavily in research and development for both current and future products and services. Along with the usual live-stream available on Apple's investor webpage, AppleInsider will be providing live coverage of the investor event starting at 2 p.m. PT/5 p.m. ET on July 22.